Tohoku University (東北大学 (東北大學 prior to 1945) Tōhoku daigaku), abbreviated to Tohokudai (東北大 Tōhokudai), located in the city of Sendai, Miyagi Prefecture in the Tōhoku Region, Japan, is one of Japan's most prestigious national universities. It is the third oldest Imperial University in Japan. 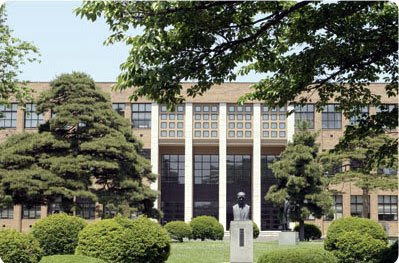 The university has 10 faculties and 15 graduate schools with a total of about 17,800 students (2007). The spirits of its foundation are "Research First(研究第一主義)" and "Open-door(門戸開放)" politics. In 2000 it was ranked no. 2 in Asiaweek Magazine's Best Universities Ranking list. 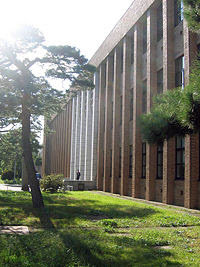 Tohoku University is committed to the "Research First" principle and "Open-Door" policy since its foundation, and is internationally recognized for its outstanding standards in education research useful in the solutions of societal problems and for the education of human resources in the capacities of leadership. The origin of the university was Meirin-yokendo (明倫養賢堂 Meirin yōkendō), which was founded as a medical school in Sendai in 1736. It was reorganized a few times. Later it became Sendai Medical College (仙台医学専門学校 Sendai igaku senmon gakkō); this was the forerunner of the medical department of the university. In June 22, 1907, the university was established under the name Tohoku Imperial University (東北帝國大學 Tōhoku teikoku daigaku) by Meiji government as the third Imperial University of Japan, following the Tokyo Imperial University(1877) and the Kyoto Imperial University(1897). From its start, it has advocated "Open-door" policy. This stems from that it first began to accept female students as well as foreign students in Japan universities, the first in the country to do so. In September 1907, it set up the faculty of Aguliculture in Sapporo; Sapporo Agricultural College (札幌農學校 Sapporo nō gakkō) took the lead it. It set up the Science (1911), and the Medical Department (1915); the latter had been Sendai Medical College. In 1918 it ceded the Faculty of Agriculture to Hokkaido Imperial University. It subsequently launched Faculties of Engineering (1919), and Law and Literature (1922). After World War II the university assumed its current name, Tohoku University (1947) and acquired new Faculty of Agriculture. Furthermore, the old Faculty of Law and Literature was split up to form new faculties of Law, Literature, and Economics (1949). Further additions: Faculty of Education (1949), Dentistry (1965) and Pharmacy (1972). Tohoku has been a national university corporation since April 2004. 2007 was the centenary of Tohoku University.